Do You Have A Paving Project We Can Help With? For any municipality, well-maintained sidewalks, roads, and streets are important to the safety of its residents, the local economy, and for the ease of traffic flow. That’s why municipal asphalt paving and repairs are a must, requiring the highest level of professionalism, a strict adherence to timelines, and the minimum amount of inconvenience for local residents. As a VDOT and Virginia Asphalt Award winner, B & S Contracting is an experienced and respected Virginia asphalt paving company with a proven record of success. From green asphalt solutions that help meet green building codes to mitigating stormwater runoff, B & S Contracting is the go-to asphalt road construction company in Staunton, Waynesboro, and Augusta County. Call for a consultation today! 540-886-8886. Asphalt paving is adaptable! Paving can be done in stages and the project completed more quickly than concrete. This reduces traffic delays, allowing traffic to return to normal more quickly. For roadway construction, B & S Contracting uses VDOT approved hot and warm asphalt mixes. Additionally, our asphalt contains up to 25% reclaimed asphalt pavement, or RAP. RAP is asphalt that has been milled from old pavement that’s reached the end of its life cycle. An environmentally sound choice, RAP also reactivates pavement, becoming part of the glue in the new pavement. As durable and strong as virgin asphalt, reclaimed asphalt pavement allows us to conserve on natural resources without compromising quality. Asphalt paving is a smoother surface than concrete roads, more skid resistant. Superior tire grip. Open-graded, or textured asphalt surfaces reduce spray and splash from rainstorms, which improves driver visibility. Increases highway safety. Black asphalt surfaces help improve visibility of lane delineation and pavement markings. When a paving surface is worn out and beyond repair, B & S Contracting will first remove the old asphalt, then identify any subgrade issues. Once those are repaired, we replace it with a new sub-base and a high-quality surface. For parking lot overlays, our engineer will determine if there has been any shift or change in the land since the previous paving. We’ll also determine whether the parking lot has proper drainage. If it doesn’t, the asphalt surface will not last. B & S Contracting will address that issue and make solid recommendations for correction. For new municipal parking lot installation, B & S Contracting employs the same careful evaluation to determine a correct installation that is durable and long lasting. Considering Asphalt Paving for Your Municipality? At B & S Contracting, our job is to provide pavement solutions that save your municipality money while extending the life of the asphalt project you’ve hired us to pave. 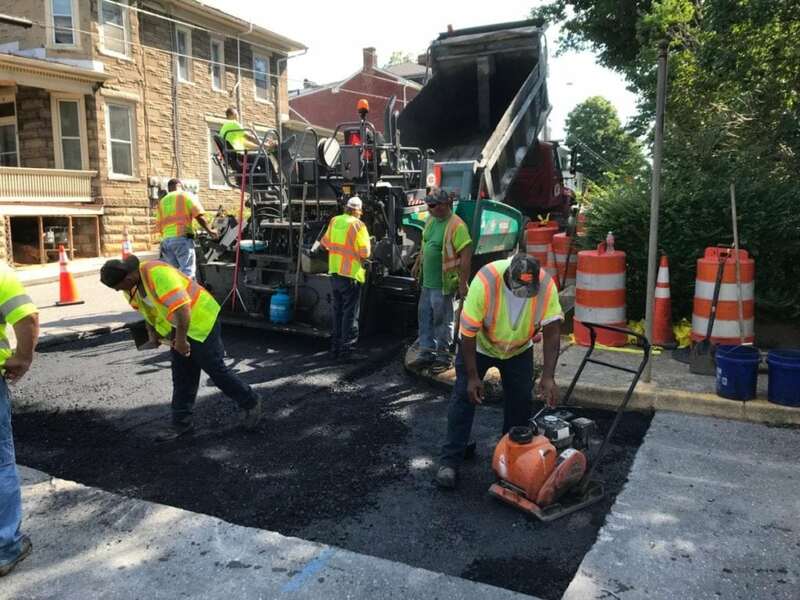 As a respected asphalt paving contractor here in Staunton, Waynesboro, and Augusta County, we can help build highways, street overlays, and parking lots in your local community that are durable and longlasting. B & S Contracting is a multiple award winning paving and contracting company in Staunton, VA offering residential, commercial, and municipal paving services, as well as asphalt mixing for paving contractors.